But while a lot of people seem to be getting into spirituality for personal gain and development, it is actually what you lose as a result of spiritual connection that has the most impact. I have to say that you will never completely lose the things I speak about in this article, and while they are quite negative, they are also natural feelings that come up from time to time. We all have the same capacity to feel what any other person feels and act in ways any other person acts, what will make a difference in your life is the level of attention you project onto these areas. A spiritual awakening is by no means the end; it in fact asks more questions than it answers. But when you reach that more enlightened state here are 6 things you will start to see a lot less of! You usually hate in others what you see a part of in yourself or what you want to see more of in yourself. A spiritual awakening helps you to hold up the mirror and see yourself stripped down to the bare bones. There will always be people in the world who have characteristics which are unpleasant to you, but the people who are expressing these traits are doing so at their current level of mind and it is up to you if you want to allow that person to dominate your consciousness. 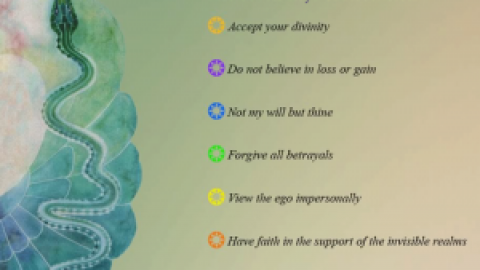 Spiritual connection helps you to show compassion for those who do you wrong and give you the ability to at least start the process of tolerance and forgiveness! An awakened mind allows you to show admiration for those who do well and strive to follow in their footsteps. It also helps to remove any malicious or jealousy and appreciate the accomplishments of others. When another person attains that which you desire, it is quite easy to feel envious, even if there are no bad intentions. Being spiritually awakened will help you to realise that we are all part of the same organism and another persons success is your success and when you see the accomplishments of others they can help motivate you to reach the same heights! Anxiety manifests as a result of living a life that you are not connected to. Your hobbies, your friends, your job and how you spend your time can contribute to that heavy feeling of anxiety. Spirituality helps you connect to your true purpose and that which matters to you. When you spend your life living on your terms, fully connected to things that have importance to you, anxiety is a lot less prevalent. Spirituality also helps you to relax, which is the complete opposite of anxiety. Anger is usually a very unconscious type of behaviour. For example losing your temper, this is not a well thought out process. Spirituality however is a very conscious process that teaches you to be present and in the moment. It also helps you to confront and deal with your problems, leaving you with less unresolved issues to be angry about. It is hard to feel insecure, when you are deeply connected to your values and you know what you stand for. Spirituality helps you connect with your identity and remove the layers which may have been left by following the wrong dreams, society, loved ones or any other influence you may have been in contact with. It helps you to know yourself and when you truly know who you are, you are far less likely to go against you true nature, just so you can please other people! This goes hand in hand with insecurity, because once you remove those layers of insecurity and actually know what you want from life you can relentlessly move towards your goals. Your goals are supposed to be scary. If they are not then you might want to consider some bigger ones! And failing on the way to achieving what you want out of life is also normal. But being spiritually connected helps you to not be afraid of being a failure, while accepting you will fail along the way. It is easy to search for external answers in life, as it seems that the answers are just out there waiting to be found. The reality is that losing things or finding what already exists within you is the key to living a healthy, happy and balanced life! Thanks for reading, let me know what you have lost as a result of your spiritual awakening by leaving me a comment below! And if you think anyone you know could benefit from reading this share it on social media, tag your friends or email it out!